Founded in 1847 in Berlin, Siemens is one of the world’s oldest manufacturers of hearing aids. As early as 1911, Siemens had begun development of electrical hearing aids. Now renowned as an innovator of hearing instruments, Siemens was the first to introduce the behind-the-ear hearing aid in 1959 and the in-the-ear hearing aid in 1966. In 2014, Siemens introduced the binax, the first hearing aid to outperform normal hearing. For this innovation, Siemens was awarded the Gold Edison Award in 2015. In 2015, Siemens was transferred under the umbrella of Sivantos Group, a leader in the hearing aid industry. 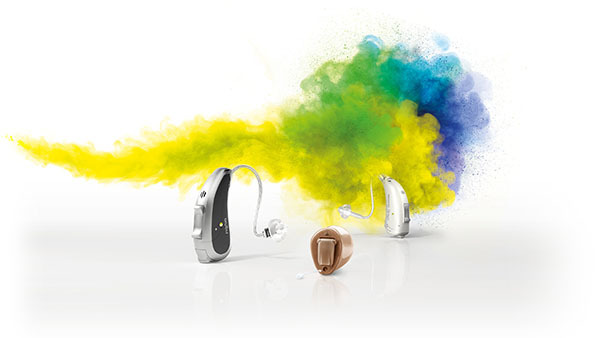 Signia is a new venture that will be co-branded with Siemens on hearing aids going forward. Signia incorporates the ground-breaking technology of micon and binax platforms introduced with Siemens, as well as the values of innovation and quality. For this dual brand, Sivantos Group says, “With Signia, we want to create a brand that is more human and personal, while building on the Siemens values of technological innovation and quality. With hearing loss, our brains struggle to make sense of muddled sound signals. Primax has been proven by independent studies to reduce listening effort throughout the day. Using a new test that measures ongoing electroencephalographic (EEG) brain activity, people who wear Primax hearing aids perform tasks and speech intelligibility tests. With hearing loss, speech recognition becomes difficult, especially in situations loud with background noise. The SpeechMaster feature uses a series of algorithms to give the wearer a clear and effortless listening experience. SpeechMaster is powered by three technologies: noise reduction, directionality, and steering amplification which allows the wearer to focus on specific speakers and elevates their voices above other sounds in the environment, whether it is quiet or loud. For music lovers and musicians alike, Primax’s HD Music feature enhances sounds to deliver music fidelity. With some degrees of hearing loss, frequencies may be missed. This has a great effect on our ability listen to the full spectrum of sound with music. To address this, Primax is equipped with three different settings. The High Definition (HD) music program offers Live Music (designed to handle a wider range of volume at a concert); Recorded Music; and Musician, for those who perform. Primax is also equipped with the EchoMaster feature, which eases listening effort for hearing aid wearers. Whether you are familiar with or new to hearing aids, you may experience some sound reverberation. Depending on the space we are in, sound arrives in our ears in many forms. Hallways, foyers, or larger rooms may cause discomfort for wearers due to the echo of sounds off of the walls and ceilings. These sounds create an interference with the other sounds that we want to hear, such as a conversation or a phone call. EchoShield balances out loud, reflected sounds and protects softer sounds. For people who suffer from tinnitus, Primax is equipped with tinnitus treatment in the form of static noise or ocean waves sound therapy. With the constantly evolving advancement of smartphones, Primax takes accessibility one step further with the hands-free TwinPhone feature. With a wireless, magnetic connection to the smart phone and the downloadable easyTek app, Primax hearing aids are compatible with smartphones and other personal electronic devices to improve accessibility. Primax wearers will be able to stream phone calls, music, and other media directly from their hearing aids to their ears. As for phone conversations, Primax TwinPhone allows the wearer to hear in both ears, improving speech recognition. For people with single-sided deafness, the Primax is available in CROS and BiCROS models, which use ear-to-ear (e2e) wireless 3.0 technologies. The CROS Pure transmitter wirelessly transfers sounds from the hearing aid side to the unaided ear. This gives wearers a fuller sound picture, with the ability to hear sound from both sides. .
Primax is available in co-branded Siemens and Signia hearing aid models: Pure, Ace, Motion, and Insio. These are available in receiver-in-canal, behind-the-ear, or in-the-air styles, to treat varying degrees of hearing loss in different performance levels (7px, 5px, and 3px). Awarded the 2015 Gold Edison Award, the binax hearing aid is one of Siemens’ most innovative hearing solutions. Based on a series of tests by independent hearing researchers, binax hearing aids have been proven to outperform normal hearing in challenging noise situations. Inspired by healthy auditory systems, the Binax hearing aid collection mirrors binaural hearing (that of two ears) and features directional microphones to capture a full spectrum of sound. Siemens achieves this feat with the binax by creating a multi-microphone network between the pair of hearing aids, using e2e wireless technology. The binax is equipped with four microphones per ear, and with e2e technology, audio data is shared between an eight-microphone network. This simulates binaural hearing, giving wearers a fuller spectrum of sound from all directions in their environment. The binax is also equipped with new and improved features. Narrow Directionality uses “directional beamforming” to simultaneously suppress unnecessary sounds and use a narrow beam to focus on specific sounds wearers prefer to hear. Spatial Speech Focus is an automatic feature that does not require wearers to make adjustments; it improves speech recognition against background noise by focusing on speech and suppressing background noise. For people who find themselves outside often, the binax’s eWindScreen binaural feature balances sound between ears in windy environments and enhances spatial perception. With wireless technology, binax hearing aids are able to link up with personal electronic devices, giving wearers better access to technology, media, and contacts. Utilizing the easyTek or touchControl app, downloadable for smart phones, wearers are able to adjust program settings and volumes discreetly. The binax family of hearing aids comes in the following models: Ace (receiver-in-canal), Pure (RIC), Carat (RIC), Motion (behind-the-ear), and Insio (in-the-ear, in-the-canal, completely-in-canal, and invisible-in-canal). The Aquaris is the world’s first fully waterproof, dust proof, and shockproof hearing aid. Aquarius has been given an Ingress Protection (IP) rating of 68 – the highest possible ranking (out of 0-6 for solids and 0-8 for liquids). Designed to withstand the elements, the Aquaris is a good choice for people who lead active lives, from athletes to nature lovers. Aquaris may be completely submerged in water with no damage and may be worn in the pool, shower, and at the gym. Aside from the incredible water and dust resistant features of Aquaris, it is full of state of the art features to enhance sound quality. The directional microphones create a sense of spatial awareness and heightened focus for the wearer, simulating binaural hearing. Feedback reduction and high-frequency management keep sounds crisp and clear. Equipped with wireless connectivity, the Aquaris provides a seamless listening experience through connection to smartphones and other compatible electronic devices. As a behind-the-ear hearing aid, the Aquarius is discreet while providing a great sound quality, with feedback reduction and automatic adjustments. It is recommended for children and teens, who require sturdy hearing aids that grow with them. Siemens hearing aid models include behind-the-ear options (Motion, Nitro, Orion 2, Sirion 2, Intuis 2, Lotus and Aquaris); receiver-in-canal options (Ace, Pure, Carat, Orion); and in-the-ear options (Nitro, Orion 2, Sirion 2, Intuis 2, and Lotus). Tinnitus therapy is also available for select models. Certain models are also rechargeable with an e-charger and dehumidifying unit, which provides a long battery life and protection from moisture. All Siemens hearing aids are designed to treat varying degrees of hearing loss, from mild to profound. For people who need an extra boost, Siemens also offers a line of assistive listening devices, all wireless. They allow wearers to stream music, media, and phone calls directly to their hearing aids, through the use of apps and portable amplification devices. The Siemens smartHome device improves security for people who are hard of hearing with alerts from sounds such as doorbells, phones, smoke detectors, etc.